It is on this not-so-humble joint that you’ll find the most tender lamb meat. For this recipe, use racks trimmed of all excess fat and aim to serve the meat rosy pink. You could swap these herbs for tarragon and mint. 1. Preheat the oven to 220˚C, gas mark 7. Season the lamb. Mix all the remaining ingredients (apart from those for the gravy) and press onto the top of the lamb. Place in a roasting tin, cover and chill for 20 minutes. 2. Roast for 20 minutes for medium rare. Remove from the tin and set aside on a carving board to rest, loosely covered with foil. To make the gravy, place the roasting tin on the hob and add the stock, wine and redcurrant jelly; use a wooden spoon to scrape up any sticky bits from the base of the tin. Season and bubble until you have a syrupy sauce; add the resting juices just before serving. 3. 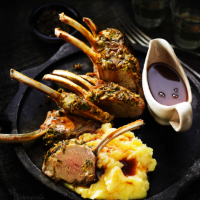 Carve the lamb into cutlets and serve with the gravy, and mashed potato and steamed greens, if liked.